In Lovers, Hester strives to encapsulate the sheer bliss of a passionate embrace, and a latent hunger to literally infuse bodies with one's beloved. 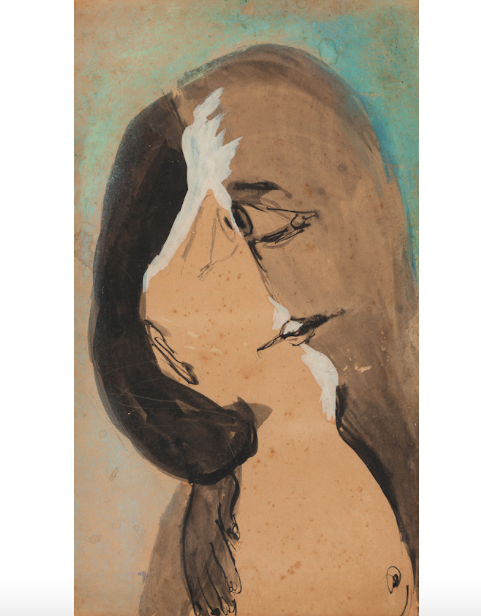 What should be a single face is split diagonally down the centre into two, a motif borrowed from Picasso, But by probing the "inner" layers of her figures Hester puts this device to uses that no other artist had attempted. The split or double face has become a symbol for a pair of lovers pressing tightly against each other. Completely oblivious to everything other than each other, the line of the lover's hair, their lips, even their eyes have apparently locked together into one visual entity. Hester's composition testifies to her acute artistic sensitiveness and invention, so much being conveyed by the simplest of means, such as the nervously emotive spindly ink lines and the softly romanticised azure wash surrounding her embracing figures.